The country’s leading manufacturer of international quality socks and trademark owner of 5 sock brands in the Philippines (Burlington, Bally, Camp, Biofresh and Puma) collaborates with the global leader in built-in antimicrobial product protection -– Microban International. This partnership lead to a revolutionary product design that is deemed to be the Best Burlington Ever given its antimicrobial properties that protects the feet from odor causing bacteria, leaving it fresh and clean all day. Microban® is ahigh profile, EPA-registered anti-microbial kills just about everything in its path: allergy- and disease-causing germs bacteria, fungi, mold and mildew. Used by over 250 companies across the globe for 20 years now, the Microban® technology is known worldwide to give long-lasting protection and fight the growth of harmful bacteria. It works by penetrating deep into the bacteria’s cell wall thus, neutralizing its abilities to develop and reproduce. In Microban's recent odor study to determine the effect of Microban antimicrobial protection has on reducing odors from bacteria. results revealed that samples with Microban antimicrobial protection generated over 250 times less malodor after the six hour period than the sample left unprotected. Microban® protected sample stayed significantly fresher throughout the entire test period. The Microban® antimicrobials applied on Burlington socks are durable enough to withstand home washes. It can withstand multiple washing machime launderings up to 50 times. “It is the perfect partner for people who enjoy strenuous sporting activities as they no longer need to worry about needing protection odor causing bacteria. With the Best Burlington Ever, their feet are treated to a comfortable, dry and odor-free experience,” he added. With over four decades of industry expertise, Burlington Philippines is the trusted name in the men’s, ladies’ and children’s socks department. The brand takes pride in its innovative and quality products that are guaranteed to fit the need of every individual. 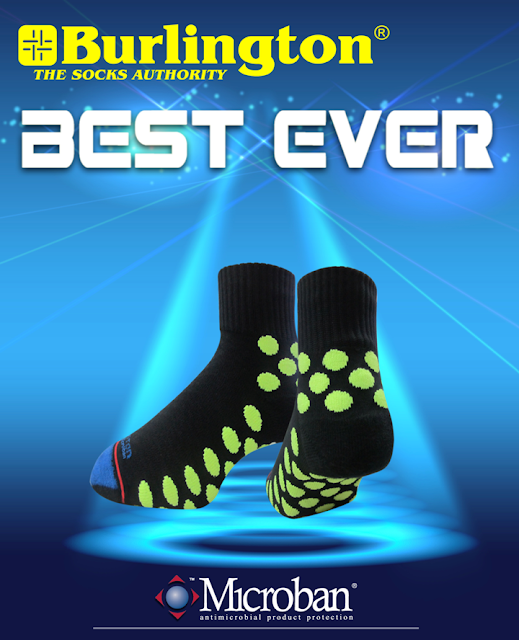 Burlington Industries Philippines has long been synonymous with socks. The Microban® socks will surely appeal to the discerning consumer tastes as it with its potent disinfecting properties coupled with ideal sock construction suited for the activity they are designed for.